I love people! All sorts of people—basically, anyone who gives me soft things to lay on and who wants to pet me and give me love and attention! I immediately took to the 5 year-old in my foster home–when he sits next to me on the couch, I lay my head in his lap so he can pet me and talk to me (this makes everyone go “awwwww”). Sometimes when I am laying in my dog bed, he will bring his own pillow over and lay down in the dog bed with me and we cuddle up together sweetly. It’s ridiculously cute. He and I are best friends. I love affection from the adults too! Though most of the time I wait for you to come and give me attention when you feel like it, once in a while I will also ask for it (in very adorable ways)! Sometimes when my foster mom is walking around in the yard with me, I will stop in my tracks, gaze up at her, and make little whining sounds (this means, “could you give me some love please?”). She will kneel down, my tail starts to wag like crazy, I put my front legs up on her legs and stretch until I can nuzzle my head up into the crook of her neck! We nuzzle together like that while she pets me and tells me what a sweet girl I am, and it makes me (and her!) very, very happy. I am quiet! 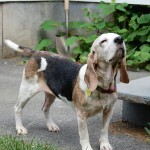 I know…not very Beagley or Basset Houndy of me, right? But it’s true! I’m the quietest girl around. In the 2 months that I have been at my foster home, I “sang” only about two times (just for 10 seconds each), which was sort of a half howl/half wookie sound that made everyone stop and then burst out laughing! And…OH MY GOODNESS. THE. SOFT. THINGS. I LOVE. THE. SOFT. THINGS!!! My foster parents say that they’ve probably never met a dog who loves laying on soft things as much as I do. The total contentment displayed on my face when I’m properly snuggled into the big soft cushions on the big soft sofa is so profound that people break out laughing just to see it. Truth be told, if allowed, I would lay on the soft sofa cushions 23-1/2 hours a day, getting up only to great you when you first come home (yippee! ), for meals (whoo hoo! ), and to do my business outside (I never have accidents indoors)! Yup, I am a very mellow, very chill, very laid back kind of gal. 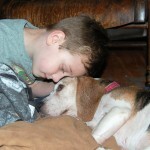 I have shown no interest in going for leashed walks, and even though I have a very large fenced in yard that most beagles would be exploring every inch of– every day- I often need to be coaxed to go outside at all, do my business 10 steps away from the deck and then often want to go right back inside! I do have brief “zoomie” moments, when all of a sudden, I happily dash around the yard in a small circle at high speed or run up and down the deck stairs with wild abandon, ears flapping in the wind! I might do this a few times a day, but other than that, I am calm as can be! I am smart! I learned very quickly that every time we dogs go out into the yard, upon returning into the house, we are all given a treat! I love treats, and caught on very quickly to this routine and also to where the treats are kept. After a few weeks of this, I actually started pretending that I wanted to go outside! I would ask to go out, stand on the deck for a few moments, then ask to be let back in and then run over to where the treat jar is, wagging my tail in excited anticipation and doing my little happy side-steppy dance that I do when I am waiting for a treat! How cute is that? And clever! 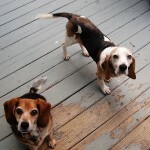 And because my foster parents are total sweethearts, it works (they just laugh and give me a treat)! I love to make a nest in my dog bed! I’m one of those dogs who wants her dog bed to be “just right.” Luckily, my foster parents have a really nice, soft dog bed for me and they gave me a blanket to use on the bed (which I love) and I will twirl in circles tugging at different corners of that blanket with my mouth and kneading the bed with my paws, until it is all fluffed up just right before happily plopping down with a big happy contented sigh. Again—uber adorable! I am perfectly fine in the car, fine at the vet, and fine getting baths, just laid back about everything! I am a SUPER loving and sweet girl with all people and kids who are gentle and respectful. I love other dogs and share my foster home with 3 other dogs (1 bigger male, and 2 females near to my size, 1 who is a Beagle). I like all the dogs very much (I am very tail waggy with them and we pal around, though don’t “play”), but am most in love with the other female Beagle! It is an extra lovefest with her! I am great with cats in that I utterly ignore them. Could care less, give them no mind whatsoever, which is generally what cats want from us dogs! Napping and cuddling with you! ON SOFT THINGS!! Nuzzling my head gently into you so that you give me more smooches and pets! When my humans talk to me! Anything involving food! Getting treats! I am in great shape! I have had exams (including orthopedic), full bloodwork panels, thyroid tests, and tick panels, and thus can tell you with confidence that I am super healthy! I did have tapeworms when I arrived, which explained part of why I was skinny, but medicine cleared that all up and I’m putting on a bit of weight and looking good! Also when I first came, my skin and coat were not in great shape (nothing contagious), so I have been getting baths twice a week with a medicated shampoo. My fur and skin are so much better now, but we’re keeping the bathing regimen up for a while to make sure that remains the case. Having floppy Basset Hound ears, I am prone to ear infections. Cleaning them after I get a bath and as needed is a must for me! Luckily, I don’t mind at all! I get Dasaquin and Turmeric because I am 8 years old and the rescue folks think it’s good for all middle aged and older dogs! My foster parents say that I am sweet as sugar. I am looking for someone who will love me and spoil me with your attention and the soft things in your house! I would love a home with at least 1 other dog in it! I am content to nuzzle up against you and nap all day long if you want me to! If you are looking for a sweet, mellow, loving pup, look no further than me! 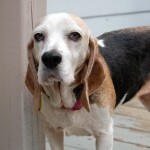 adult, Basset hound, Beagle, female, good with cats, good with dogs, good with mature kids, small, spayed. Bookmark.